We have three rooms for you to choose from featuring Corbett House unique charm and character for you to enjoy. Each with beautifully preserved heritage features and beautiful views over the grounds. All bookings are inclusive of a full cooked or continental breakfast. Read more about our breakfast offerings here. Please note: Check in is from 2pm, check out is by 11am. Unfortunately due to the age of the house we are unable to accommodate guests with mobility issues, as all the guest bedrooms are located upstairs. Corbett House is a SMOKE FREE HOUSE. No children under the age of 14. There is no capacity for extra beds in the rooms. The largest of our three rooms, the Kauri room features rimu ceilings trims and joinery. 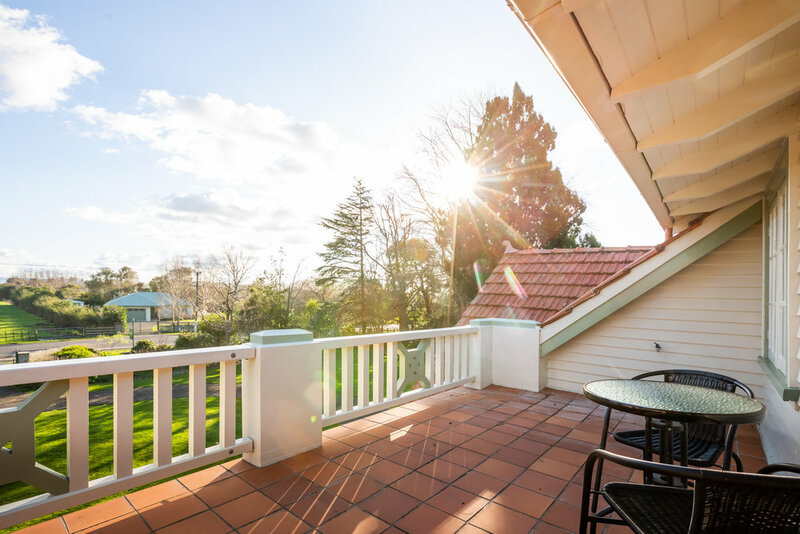 The room has charming french-style doors that lead onto a large terracotta tiled deck, which is shared with the Rimu room and is the perfect location to watch the sunset. We have chairs and a table should you wish to relax and enjoy the views over the front of the property. The room itself has a queen sized bed made up with quality bed linens. This room has oak bed side tables, each with a table lamp. An oak Arts and Crafts style wardrobe and a large kauri dressing table gives ample storage. 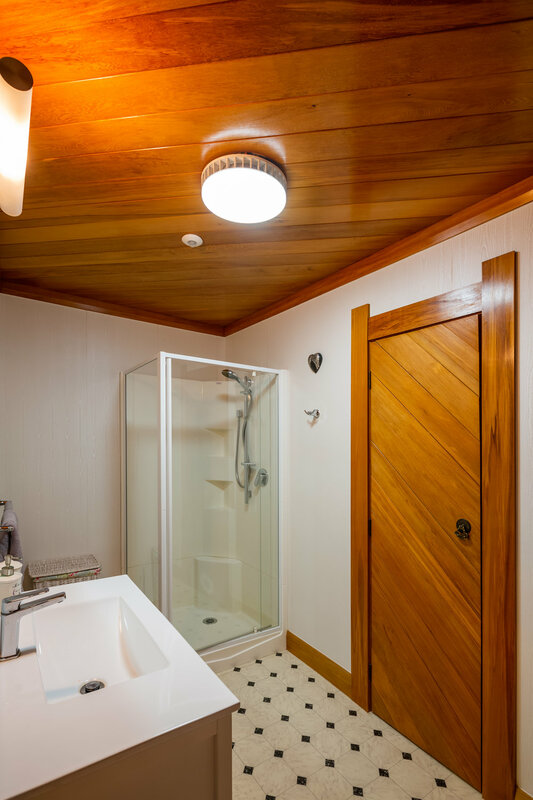 The spacious ensuite has all the modern amenities such as a large shower, a charming oak vanity, mirrors, heat-lamp/light/fan and heated towel rails. This charming room has french style doors leading onto the shared terracotta tiled deck with chairs and a table for your use. 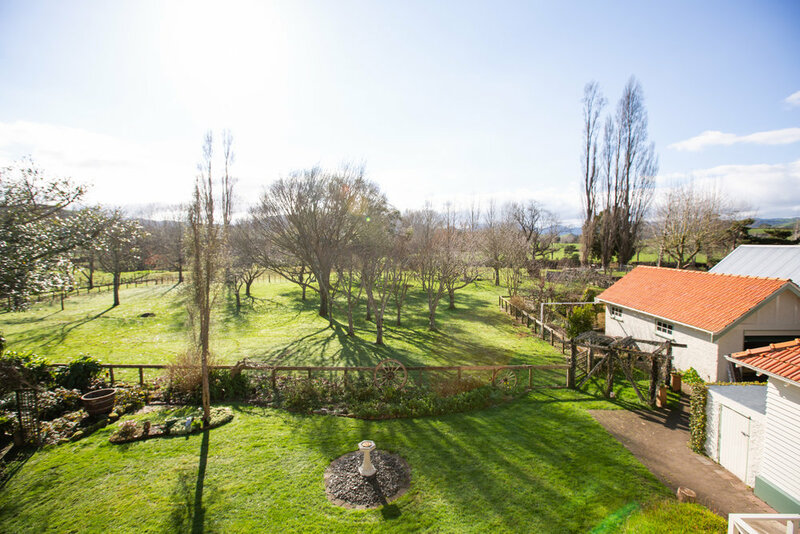 With views over the front of the property it has a unique perspective taking in surrounding farmland and the mature specimen trees and well developed gardens. This is the perfect spot to watch the sun go down. The room itself features rimu ceiling trims and joinery and a brass queen sized bed made up with quality bed linen. This room is full of old world charm with the original 1920s wallpaper. The room is beautifully decorated with antique furniture, including two bed side tables, each with a table light, a large oak wardrobe with an oval mirror and a matching oak dressing table. This room shares a stylish bathroom with the Titoki room which is tastefully decorated with a spacious modern shower, modern vanity and heated towel rails. This character rich room has views of the back of the property and surrounding paddocks. This double room features rimu ceiling trims and joinery, with the original 1920s wallpaper adding to the rooms unique charm. The antique furniture consists of a large double brass bed, made up with quality linens. The room also has a large dressing table and two bedside tables, each with table lamps.